Beer is comprised of four primary ingredients. Water, Malt, Hops, and Yeast. And they all play a big role in the beer you make. Let’s break it down. Once you understand the ingredients and what they do, making your own beer is fun and easy. Plus you get beer to drink! Water: The first ingredient on the list is water. It makes up the bulk of the total volume of beer. The science behind water chemistry in beer can seem very complicated to a new brewer, and to be honest, it’s not something a new brewer should worry about just yet. The thing to remember is that if your water tastes good, it will make good beer. Malt: This is where your beer starts to become beer. Malt is short for malted barley and it provides a few key things to your beer such as flavor and color. But it also provides one more key ingredient. Sugar. How does grain become sugar? Well it has to go through a few steps, which I’ll cover briefly. First the barley is harvested, then it goes through a controlled germination process called malting (hence malted barley). Here the grain is treated as if you were trying to have those grains sprout into new barley plants. The seeds are then heated which stops the process. Sound complicated? Don’t worry about it because the grain purchased by homebrewers has already gone through this process and is ready to mash. The mash takes the energy that the grain was creating to sprout a new plant and converts it into sugar. This sugar is is complex and flavorful (much more-so than table sugar which is why you can’t add hops to sugar water to make beer). If the concept of mashing is still too complex for you, there is extract brewing, which removes the need for grain all together. More on that later. Hops: As we learned, malt is used to create sugar, color, and flavor. But since we have all that sugar, we need to add something to balance it, and prevent your beer from tasting too sweet. Hops, when boiled, release acids into the wort (beer that hasn’t been fermented yet) which add bitterness, flavor, and aroma to the beer. The longer hops are boiled the more bitterness they add, and less flavor and aroma end up in the final beer. This is because the components that add flavor and aroma can be boiled off, so after 10-15 minutes they will be removed from the beer. Yeast: Last but not least is yeast. It converts sugar into alcohol and carbon dioxide. This is how your beer becomes beer. However this isn’t just bread yeast, and it’s important to know that beyond ethanol production, yeast also provides its own flavor and character too the final beer. Different strains of beer yeast will leave more or less sugar behind as well. Now that you have a general understanding of the ingredients in beer, we can focus on how to make beer. I’ll be including a full step-by-step guide for all three parts in a later article. The first step to making your own beer is wort creation. This is where we want to extract the sugars from our malt to be later used by the yeast. There are two main methods of beer brewing, and the differences come into play in this step. These methods are all grain brewing and extract brewing. With all grain brewing, you are responsible for converting the starches in malted grain into sugar. This is called mashing. You might find some complicated in depth explanations on how to mash grains but the long and short of it is soaking crushed grain in ~150F (65.5C) for about an hour, then rinsing the sugar from the grain (called sparging). In extract brewing, the mash and sparge has already been completed, and the sugar solution has been reduced to either a syrup (liquid malt extract) or powder (dry malt extract). 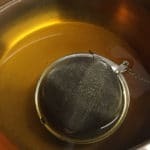 All that needs to be done with extract is dissolve it in hot water and move on to the boil. Once boiling, extract and all grain brewing follow the exact same process. I’ll be including a full step-by-step guide for both methods in a later article. In this step you’ll be doing two things mostly. First, by boiling the wort, you kill all the little bacteria and microbes that were living on the grain (most would have been killed in the mashing process, but this is an extra measure). Second, you’re boiling hops to add flavor, aroma, and bitterness to balance the sweetness of the wort. Now you may be thinking, I add the 10 minute hop ten minutes into the boil, and the 60 minute hop after 60 minutes. However these schedules are backwards in the homebrewing world. A typical boil will be 60 minutes long (however some recipes call for 75-90). So instead, the 60 minute addition of hops need to be boiled for 60 minutes. If you’re doing a 1 hour boil, add the hops once the wort starts boiling and start a 60 minute timer. Once there are 10 minutes left on the timer, you would add your 10 minute hops (so a 20 minute addition would be with 20 minutes left on the timer). Once the timer goes off, you turn off the heat (ending the boil), and add your 0 minute / flame-out additions. These two terms (0 & flame-out) are interchangeable. You might also see a whirlpool or hop-stand addition. Hop Stand additions are added after the boil is turned off, and you let them sit for the given time before you start to cool the wort. Whirlpool additions are added while you are cooling the wort. A whirlpool is more of an advanced brewing technique, but you spin the wort to collect the sediment in the middle of the boil kettle. Dry Hops are added a certain number of days before bottling or kegging. Be sure to add them in a nylon mesh hop bag or similar to keep them from muddying up your beer. All of these hop additions seem confusing. Thankfully, hop-stands and whirlpools are more reserved for big IPAs. Most recipes only include the standard boil additions (60, 5-10, and 0), and maybe some dry hopping. Now your boil is done and you must first and foremost, cool your wort to around 70F (21C) if you can, but under 110F (43C) is safe before transferring to a fermentation vessel. There are many ways to cool your wort. 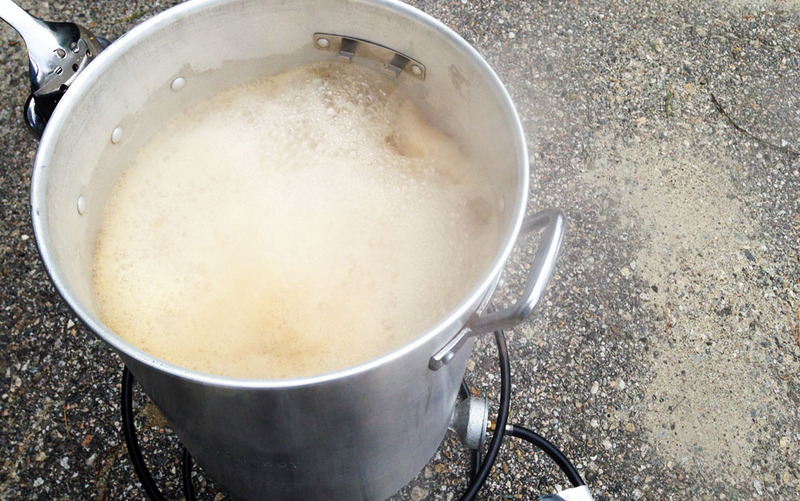 The quickest is to use a wort chiller, which attaches to a sink or garden hose. If using an immersion chiller (A copper or steel coil that goes directly into your beer, then cold water is run through the coil), add it to your beer with about 10 minutes left in the boil. This will sanitize it. 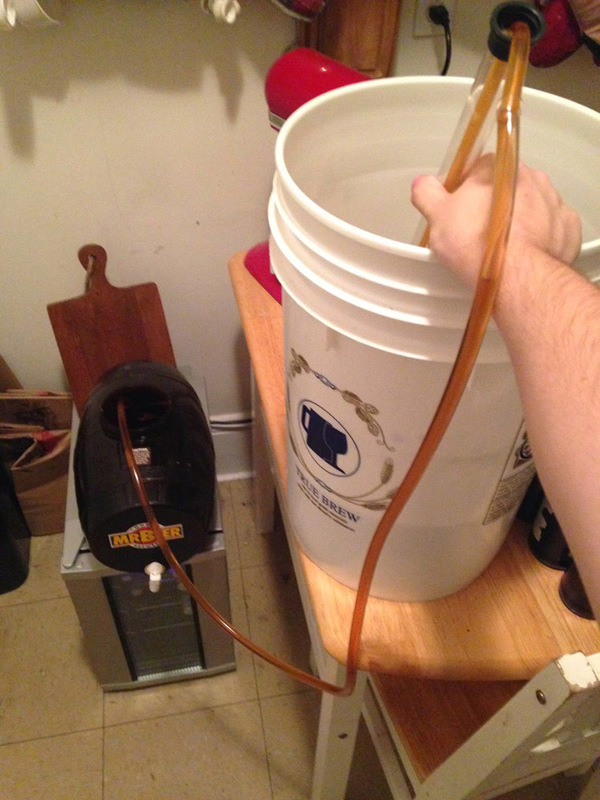 If you don’t have a wort chiller, it will be harder to reach that magic 65-70F (18.3 – 21C) number. Sitting the kettle in an ice water bath is your next best bet. Stirring the wort while it sits will accelerate the cooling process. If you transfer to your (sanitized) fermenter between 75F-110F (23.8C – 43C), you need to wait for it to free drop to room temperature. This can take 12-24 hours. In this time the risk of infection is higher, so it’s even more important that your fermenter is well sealed under an airlock, and sanitized well with something like Star-San. Note: Anything your beer will touch after the boil is over should be sanitized. Having a spray bottle of Star-San ready makes this very easy. It’s better to be over-sanitized and not sanitized enough. Pitching Yeast and Aerating. Once your wort is at a temperature that’s healthy for yeast (65 – 70F / 18.3 – 21C), take a gravity reading (this will help you calculate ABV and track fermentation) add your yeast to the wort. It’s now Beer! There’s one more maintenance step, aeration. 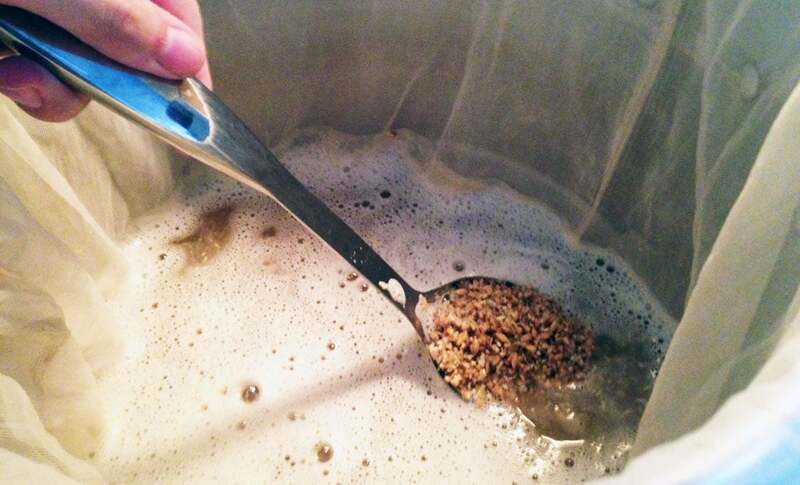 Yeast need air during their growth phase, so use a whisk to aerate the beer. You can also use an aquarium pump with an in-line air filter installed. 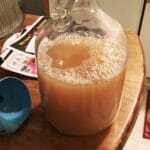 This will help the yeast complete a healthy fermentation with less fusel alcohol (taste harsh), and less off-flavors. Fermentation Management. 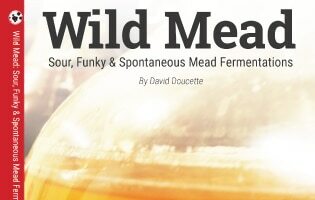 Give your beer 2-3 weeks to ferment. It can be tempting to open it up to check on it, but adding air at this point is counter-productive as it can dull hop aroma, and the overall flavor of your beer. You also want to keep the beer from becoming too warm. Put it in a cool area of the house (basement’s work great in the Summer). Ideally between 60-65F (15.5 – 18.3C) . You can also modify a fridge or chest freezer to act as a temperature controlled chamber (but more on that later). Once the 2-3 weeks is up, it’s time to take a gravity reading again and bottle or keg the beer.